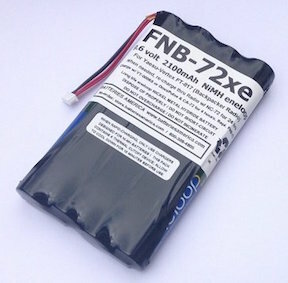 FNB-72xe: 9.6v 2100mAh READY-TO-USE NiMH battery for Yaesu FT-817. Home > Ham Radio > FNB-72xe : 9.6v 2100mAh ENELOOP rechargeable NiMH battery pack for Yaesu-Vertex FT-817. READY TO USE! 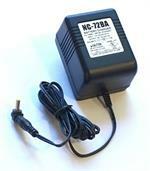 FNB-72xe: 9.6 volt 2100mAh PRE-CHARGED & READY-TO-USE NiMH battery for Yaesu FT-817 backpacker radios. Replaces original OEM battery #s FNB-72, FNB-85. 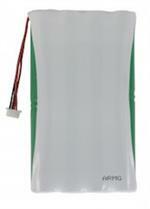 It provides full high-watt Tx capability. 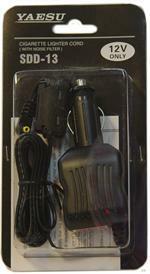 Made with eneloop NiMH cells; it RETAINS ITS CHARGE when not in use ! The battery pack can be re-charged in several ways: (1) Inside the FT-817 with an NC-72B wall charger or E-DC-5B/BA vehicle charger; (2) externally with the WC-72 Wall Charger (plugs directly into battery); or (3) with the CA-72 adapter & a stand-alone NiMH smart charger (sold separately). This exclusive premium product is made by US, right here in the U.S.A.; it arrives to you PRE-CHARGED and READY TO USE !! 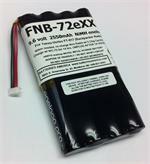 FNB-72eXX: 9.6 volt 2550mAh READY-TO-USE long-life NiMH battery for the Yaesu FT-817 radio. Replaces FNB-72, FNB-85. This battery retains its charge when not in use. Made in USA by BATTERIES AMERICA.